ANNOUNCEMENT: Due to our holiday break, we would like to extend this offer to 2nd January 2018. Hope that you can enjoy our promotion! A silent night, a star above, a blessed gift of hope and love. A Merry Christmas to you and your whole family! 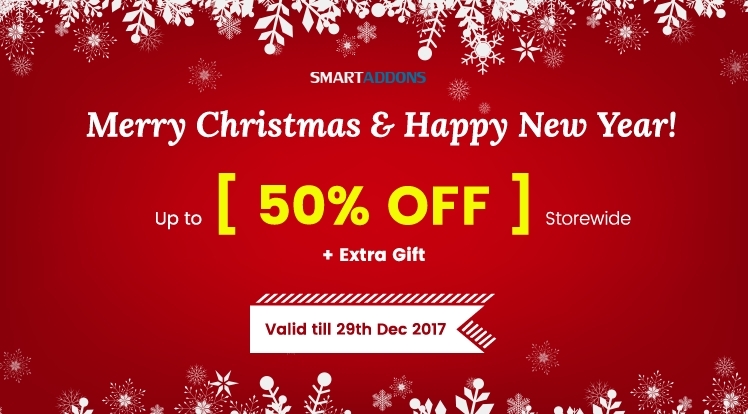 To celebrate this special holiday season, SmartAddons would like to give you exciting offers for all our products including Joomla Templates, Extensions and subscription plans as well. This offer is available to 02nd January, 2018! So don't miss out this great chance. Wait! It's not all about these offers. Lets scroll down and get our exclusive gift. Especially, within our promotions, you will have an opportunity to get 10% extra discount when you share this good news to your friends! If you have any problem with sharing, please contact us here. Just share to unlock the new coupon code. Note: The Discount on Renewal has been updated as following: 5% for Business Subscription and 10% for Developer Subscription. The offer applies on all Joomla templates and extensions that you can afford to access high quality products at really low prices. The special offers are valid only to 02 January 2018! Hurry up! Don't miss out on this awesome saving. We hope that with these free Xmas gifts, you will have a wonderful website in the Christmas 2017 season.